If you are involved with Christians who have returned to keeping the holidays in the Biblical calendar, then you have probably encountered more than one way of determining the dates on the calendar. If you have been involved with the idea very long, then you have probably encountered a dozen of them. Many if not most of those who hold to the varied interpretations of the Biblical calendar do so because they firmly believe that that is what the scriptures teach, and for that I applaud them. Even though I write this article, with what I think is the correct interpretation, I in no way want people to take my word for it. Please, study the Word, question me where you think my logic fails or I have missed a key point, but ultimately, live before God with a clear conscience and keep His calendar to the best that you currently know it. Before getting into the details, there is one attitude that I have encountered in people keeping the Biblical calendar, that I believe has no place in a believer. This "lame excuse" is deciding not to study the issue to a conclusion for themselves, but instead choosing to go by a calendar (usually the traditional Rabbinic calendar) either because that is what most people are doing or because they want to be in unity with other people around them. I believe this is a violation of Exodus 23:2 which says, "Thou shalt not follow a multitude to do evil; neither shalt thou speak in a cause to decline after many to wrest judgment." If you adhere to an incorrect calendar, thus disregarding the true feasts, based on what others are doing, then you have "followed a multitude to do evil." The basics of the calendar were put in place at creation and God said that the lights in the heaven are for determining seasons (Hebrew word for Feasts), days and years. The light of the sun rules over the day and the light of the moon and stars rules over the night. Key to understand here is that in each case the light is emphasized, not just the heavenly body. In fact, in Genesis where it specifically says they are for determining days and years, the word for light is used exclusively and the words for sun and moon are not in the passage. This immediately is a strong argument against using the Rabbinic calendar since the calculations it is based on do not consistently match up with the reality of the lights in the heavens. Another interesting question raised is, "Which point on the earth do we use as a viewpoint for seeing the lights?" The details in the Torah about the Feasts were given to Israel as they were about to enter the promised land and Deuteronomy 11:12 says of that land, "the eyes of Yahweh thy God are always upon it, from the beginning of the year even unto the end of the year." Considering that, I think it is reasonable to infer that the beginning of the year must be determined based on the lights in the heavens as observed from the promised land. Seeing the centrality of the land of Israel in the scriptures, it is hard to imagine that anywhere else could possibly be the key location when one is necessary to understand a command. I have heard it argued that the scriptural day begins with the daylight portion and is followed by the night portion. While some passages can be made to work with this theory, there are others that necessitate the night coming before the daylight in a scriptural day. As an example, Exodus 12:18-19a says, "In the first month, on the fourteenth day of the month at even, ye shall eat unleavened bread, until the one and twentieth day of the month at even. Seven days shall there be no leaven found in your houses." Since Biblical numbering is inclusive, counting from the evening of the 14th to the evening of the 21st would actually be eight days if days started in the morning. I.e. (night of the 14th = 1, 15th = 2, 16th = 3, 17th = 4, 18th = 5, 19th = 6, 20th = 7, day of the 21st = 8) Similarly, the Day of Atonement starts "the ninth day of the month at even," but is also said to be "on the tenth day of the month" not "on the last part of the ninth and first part of the tenth." This is further borne out by the thirty passages stating that uncleanness lasts "until the evening" which indicate evening as containing the delineation between one day and the next. Still there are many interpretations about how long evening is and what exactly starts the new day. Narrowing down the options to those that match the basic concept of observation of the lights in the heavens, there are a couple astronomical events that occur daily in the general time frame of evening. One is sunset and the other is the first appearance of the stars. Sunset is the traditional Jewish understanding and the overall structure of the calendar also fits well with using the appearance of the first stars. These two situations, each time referring to the same type of uncleanness, give two different descriptions of when the man is clean again, "until the even" and "when the sun is down" basically equating them. From this we can know that evening hits when the sun is down. Here we see in verse 22 that they worked during the day and were guarded during the night. Verse 21 defines that working time, "day," as from sunrise until the stars appeared. With that definition, the time frame after sunset and before the stars appear, (evening) was included as part of the previous day. Also Leviticus 23:32 and Exodus 12:18 quoted above, show that "b'erev" or "in the evening" is numbered as the final part of the day, not the first part of the next. Now to take Genesis 1 at face value, evening (between sunset and stars appearing) is neither day nor night as neither the greater light nor the lesser lights are "ruling." While strange to our Greco-Roman idea of 24 hour days having a one second transition to the next, it seems to makes sense within scripture that that 20-30 minute period between two days where none of the heavenly lights are visible is the transition. This would explain how "evening" seems to be considered the end of the day by many passages, but also "the 9th day of the month in the evening" is when the Day of Atonement, called the 10th day, begins. So, while a Biblical calendar day begins to end at sunset, it is hard to prove the next one has fully begun until the lesser lights appear. Not coincidentally, this leads perfectly into the next section. 2 Chronicles 8:13 [burnt offerings] Even after a certain rate every day, offering according to the commandment of Moses, on the sabbaths, and on the new moons, and on the solemn feasts, three times in the year, even in the feast of unleavened bread, and in the feast of weeks, and in the feast of tabernacles. The word we see translated as month and as new moon is essentially the same in Hebrew, "Chodesh" and has the same root as "Chadash" meaning "renew or repair." Astronomically speaking, the new moon is the point in the moon's cycle when it is in line with the sun, and thus no light reflects towards earth. However, the Hebrew idea of a new moon, especially considering the light of the moon being the key factor, does not fit with that. The underlying meaning of the word, the principle of using the lights in the sky, and Jewish history and tradition all agree with the first visible sliver being the declaration that a new month has started. Matching up beautifully with evening beginning the day, the new moon first appears soon after sunset and right around the time that the first stars appear. Thus, we find out right at the beginning of a new day if it is also the beginning of the new month. Genesis 8:3 And the waters returned from off the earth continually: and after the end of the hundred and fifty days the waters were abated. Some will try to argue that the dates in the flood story show that all months must be exactly 30 days long. Since the lunar cycle is approximately 29.53 days long, new moon based months end up with either 29 or 30 days. What they forget to take into account is that Hebrew numbering is inclusive. So, counting 150 days from the 17th of the 2nd month, to the 17th of the 7th month actually includes both 17ths in the count! Therefore Genesis is actually describing a five month period in which four of the months had 30 days and one had 29 days. This confirms that the lunar cycle, and not a flat 30 days, is the length of the Biblical month. 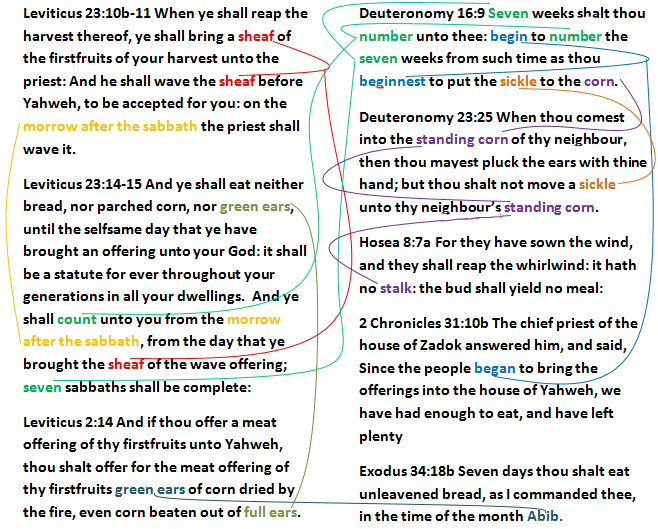 Leviticus 2:14 And if thou offer a meat offering of thy firstfruits unto Yahweh, thou shalt offer for the meat offering of thy firstfruits green ears of corn dried by the fire, even corn beaten out of full ears. Determining the beginning of the year is the biggest puzzle in studying the Biblical calendar. Unlike the beginning of days and months, there does not seem to be an easy solution like simply looking up at the sky and confirming whether or not you see the sun, moon or stars. What we do have though are some contextual clues. For instance, we know that the first month is named "Abib" or "Aviv" which is the same word translated literally in Leviticus 2:14 as "green ears." There is pretty much no question that the month of Abib falls in the spring. The word "Aviv" even means spring in modern Hebrew. 11 And he shall wave the sheaf before Yahweh, to be accepted for you: on the morrow after the sabbath the priest shall wave it. 12 And ye shall offer that day when ye wave the sheaf an he lamb without blemish of the first year for a burnt offering unto Yahweh. 13 And the meat offering thereof shall be two tenth deals of fine flour mingled with oil, an offering made by fire unto Yahweh for a sweet savour: and the drink offering thereof shall be of wine, the fourth part of an hin. The first problem that must be dealt with is that adding up 12 lunar based months of 29.5 days gets 354 days and a solar year is 365.24 days. Without correction, this would cause the first month to drift away from spring by 11 days each year, quickly resulting in Abib not being in the spring at all! So in that respect a leap month solves the same problem as a leap day in the Gregorian calendar. This is clearly necessary since the firstfruits offering is to be offered during the Feast of Unleavened Bread. Since the growth of crops is tied to the solar year and we need firstfruits to consistently be available during the month of Abib, a 13th "leap month" must be added every two or three years. So between Ezekiel 1:1 and 8:1 we have 437 days passing. However, given a year of 12 lunar months, or even a 365 day solar year, there simply aren't enough days available between the dates. The first gives us 414 days and the second 426. Neither of those works, but if you add a 13th lunar month there are 443 days available! This means that only a calendar that sometimes contains a 13th month can give enough time for all of the events to happen between those dates. Click to open full size version. 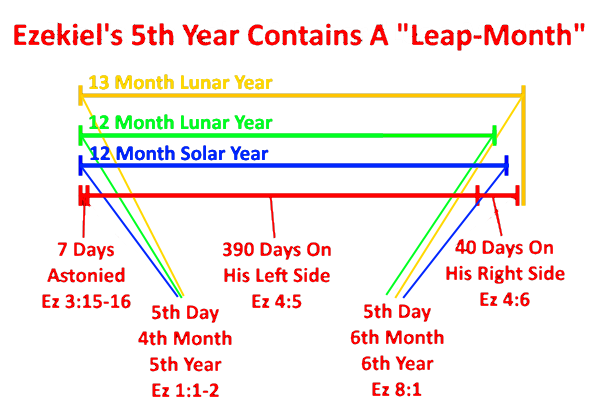 In order to know which years should have an extra month and which years should not, there have to be some criteria that let us know at what point in the solar year we start a new lunar year. Since the new moon can occur on essentially any day of the solar cycle, what we need is a 30-day period of the solar cycle where if a new month begins, we know to also start a new year. If the month following the 12th month falls short of that 30-day period in the solar cycle, then it would be counted as a 13th month. There are a few scriptures and several modern and historical sources in which we can find data regarding when the year would start. The above chart is a compilation of all the major evidence I found on the subject. I have used the spring equinox as the marking point in the solar cycle and I use the Gregorian year 2019 since that is the year I am writing this. (For the record, in 2019, the moment of the spring equinox in Israel was just before midnight on March 20.) I believe that charting the evidence makes the pattern of when a year must begin pretty clear, but read below for the explanation of each row in the chart. Deuteronomy 23:25 When thou comest into the standing corn of thy neighbour, then thou mayest pluck the ears with thine hand; but thou shalt not move a sickle unto thy neighbour’s standing corn. The verses in the image above all paint a picture together once you look at the underlying Hebrew words. Unfortunately, English translations don't bring out the fact that the same root word is being used in several of the cases, which is why I have added color coding to help map them together. If you follow the connections, several things come to light, but at this point I want to focus on one major theme. The sheaf offered on the first day of the count to Shavuot is also the first time that any grain is cut on a national level. It consists of grain that contains at least some food value and is harvested that day. Not surprisingly, this also matches up with the historic testimony of how the wave sheaf was offered, but we have an even better second witness. Yeshua, in His first coming, fulfilled the spring feasts, which means we can use that as a second divine source of information about how the feasts work. In 1 Corinthians 15:20 it says, "now is Christ risen from the dead, and become the firstfruits of them that slept." So to look back at the shadow in light of the fulfillment, the field of grain is "those who sleep." Christ, as the firstfruits from that field, rose from the dead on the day of the wave sheaf offering. The beginning of the harvest is thus tied to that particular day of the year. There are groups who scour the land of Israel each year, looking for barley that is abib or that they think will have reached legitimate food value on the day of the wave sheaf offering. There are two major groups that I am aware of, and they each use slightly different criteria when examining the crop. However, while I appreciate the zeal, the barley is not a light in the sky and thus does not decree the new year; it can only be used as a guide to help us determine the appropriate sign in the heaven. When you factor in that occasionally the two groups disagree over the state of the crop and one year in which they did agree that the crop was too immature to start the year, they later found abib barley on the day that would have been the day of the wave sheaf. Also to be considered is that the current size of the nation of Israel is smaller than the borders given in the Torah and less barley is grown today. All of these factors indicate that while the barley can be a valuable indicator, it doesn't work well as a final arbiter. However, if the barley matured faster than these groups expected, if we did have more barley to look for available firstfruits in, and if the borders of Israel were expanded, then we would expect the start of the year to be a little earlier in the solar cycle than what the current barley groups are declaring. In the chart I have put one row (#2) marking the dates that the two barley groups agreed on when to start the year, and one row (#3) for when there was controversy, picking the early dates over the late ones in the controversial category for the reasons above. 1 Samuel 1:20 Wherefore it came to pass, when the time was come about after Hannah had conceived, that she bare a son, and called his name Samuel, saying, Because I have asked him of Yahweh. Psalm 19:5 Which is as a bridegroom coming out of his chamber, and rejoiceth as a strong man to run a race. The Hebrew word in common between these passages is "Tekufah" and since it is used in conjunction with the timing of Tabernacles in Exodus, it could be used as another indicator to work back to the beginning of the year. In some of the Dead Sea scrolls, the book of Enoch and some other later Jewish sources such as the Talmud, Tekufah has been connected to or has a meaning of Equinox or Solstice. However, just looking at the usage in the three scripture verses in a literal translation brings some doubt as to whether the meaning of the word has stayed constant over time. For instance, Young's Literal Translation renders it as, "Revolution of the Year," "Revolution of the Days," and "Revolution of the Sun." This usage fits reasonably with each passage, whereas if one were to use "Equinox of the Year," "Equinox of the Days," and "Equinox of the Sun" the term doesn't fit well. Psalm 19 (especially considering the Hebrew meaning behind "ends") describes the sun from sunrise to sunset. Samuel describes the completion of the days of Hannah's pregnancy. Neither of those work out naturally with a meaning of equinox. Still, since it has a small possibility of being meant that way, I have added to the chart the days that one would need to start the year in order to have the autumn equinox fall during the Feast of Tabernacles (row # 4). There are only 8 days in the Feast of Ingathering and the equinox only happens on one day. However since there are six months between the start of the year and the feast of which it is possible for an extra month to have 29 or 30 days, it is possible for days within a 10 day span to make the equinox and feast match up. Thus I have added a 10-day span to the chart. Yeshua told his disciples while He was with them to do what the scribes and Pharisees said to do, but not to follow their example of disregarding what they actually taught. This is sometimes used as a proof text that we should use the Rabbinic calendar since Yeshua said to obey their teachings, basically claiming that the Jewish rabbis still have authority in this area. However, the parable in Luke 20 clearly refutes this as with the death of the Son, the vineyard was taken from them and given to others. We later see that the authority taken from the Jewish Rabbis was given to the Apostles. This fits perfectly with Acts 15 where when there was need of a ruling about the Torah, the case was taken to the Apostles, not to the Sanhedrin. I do find the idea to "do as they say and not as they do" interesting in that we might be able to glean some data about the calendar from the Rabbinic rulings on the subject. Looking at the Talmud (TB Sanhedrin 11b) as well as a couple quotes from Yaakov Loewinger, a modern Israeli engineer who has studied the mathematics of the fixed Rabbinic calendar extensively we see that one of the foundations of the original calculations for the Rabbinic calendar was that the First day of Unleavened Bread must fall on or after the Equinox. Loewinger's exact quote is, "It seems this  intercalation is not necessary in order to achieve the main objective of the Hebrew calendar, namely to cause the relevant days of Pesah 5765 to fall after the Vernal Equinox." Also Menachem Posner on Chabad.org writes, "The primary factor, which overrode all others, was the spring equinox. If the spring equinox would fall later than the first half of Nissan (i.e., on the 16th or later), then the year was automatically declared to be a leap year." Since the fixed calendar was originally set up, minor errors in the calculations have compounded so that in modern times the Rabbinic calendar is sometimes incorrect even according to its own stated purpose. Thus, "They say, and do not" is once more true. Still, even though the Rabbinic rule of intercalation, or adding a leap month, is not authoritative after Yeshua's death, I have charted it as a row (#5) of historical evidence. And while they suppose it proper to honor God, from whom they obtain this plentiful provision, in the first place, they offer the first-fruits of their barley, and that in the manner following: They take a handful of the ears, and dry them, then beat them small, and purge the barley from the bran; they then bring one tenth deal to the altar, to God; and, casting one handful of it upon the fire, they leave the rest for the use of the priest. And after this it is that they may publicly or privately reap their harvest. They also at this participation of the first-fruits of the earth, sacrifice a lamb, as a burnt-offering to God. Josephus, as a first century historian, confirms several aspects about the barley harvest that we found in the scriptures. First, he states clearly that the day of firstfruits precedes the rest of the harvest. He also mentions that the firstfruits offering is dried before being offered, which would indicate that it did not reach maximum dryness while on the stalk, but still has enough food value that it can be ground into flour. This matches up with the specifications for fire-dried aviv grain being suitable for a firstfruits offering in Leviticus 2:14. The sun is literally in Aries on the day of Passover. The sun is literally in Aries during the first month. The sun is in Aries' 30-day sector on the day of Passover. The sun is in Aries' 30-day sector during the first month. I calculated the maximum number of days of the month that can fall while the sun is "in Aries" and counted 14 days so that Passover falls in that span, and then added two more rows to the chart (#6 and #7). (152) for which reason this is very correctly set down in the law as the first month, since, in a manner, it may be said to be an impression of the first beginning of all, being stamped by it as by an archetypal Seal. (153) Although the month in which the autumnal equinox occurs is first in sequence according to solar orbits, it is not considered first in the law. The reason is that at that time, after all the crops have been harvested, the trees lose their leaves and everything that springtime produced in the height of its glory is withering under dry winds after it has been made dry by the flaming heat of the sun. (158) And the unleavened bread is ordained because their ancestors took unleavened bread with them when they went forth out of Egypt, under the guidance of the Deity; or else, because at that time (I mean at the spring season, during which this festival is celebrated) the crop of wheat is not yet ripe, the plains being still loaded with the corn, and it not being as yet the harvest time, and therefore lawgiver has ordained the use of unleavened food with a view to assimilating it to the state of the crops. For unleavened food is also imperfect or unripe, as a memorial of the good hope which is entertained; since nature is by this time preparing her annual gifts for the race of mankind, with an abundance and plenteous pouring forth of necessaries. XXIX. (162) There is also a festival on the day of the paschal feast, which succeeds the first day, and this is named the sheaf, from what takes place on it; for the sheaf is brought to the altar as a first fruit both of the country which the nation has received for its own, and also of the whole land; so as to be an offering both for the nation separately, and also a common one for the whole race of mankind; and so that the people by it worship the living God, both for themselves and for all the rest of mankind, because they have received the fertile earth for their inheritance; for in the country there is no barren soil but even all those parts which appear to be stony and rugged are surrounded with soft veins of great depth, which, by reason of their richness, are very well suited for the production of living Things. Philo of Alexandria, another first century historian, makes several more interesting statements regarding the timing of the calendar. He reiterates that the wave sheaf is a first fruit of the whole country and also states that it is not yet harvest time at Passover. This again works well with a description of a nearly mature, but fire-dried firstfruits, though Philo also makes a statement that all the crops have been harvested by the 7th Biblical month. If he is referring to everything, including the grapes and the olives, then at least one of his time frames will not work out well as the overall growing season in Israel is longer than the five and a half month period he allows for it. If, however, by crops he means just the grain, as in the barley and the wheat, then his statement can work out pretty well with what we have seen in other testimony. The most time-specific statement that he makes, as far as something we can chart, is that the Autumnal Equinox falls in the 7th Biblical month. I have added a row (#8) to the chart showing the days that the year could be started if this is in fact always true. As I mentioned earlier, the word Tekufah found in some of the Dead Sea scrolls as well as in the Talmud and a couple other historic books is thought to apply to the Solstices and Equinoxes. If you dig into the calendars that are described though, they consist of solar years (that ignore the moon for months) with four equal length seasons of 91 days. This of course already poses mathematical problems since a total year length is 365.24 days, so unless they used leap year rules that are not mentioned in the documents, such calendars would quickly stray far away from the actual Solstices and Equinoxes. This is widely recognized. What is not widely recognized is that even if we assume the best case scenario of where we add in the leap days they need, the calendars they describe are still mathematically faulty. At best they could only have one (or every fourth year two) of the Equinoxes or Solstices fall on the right day. The others will certainly be multiple days off. The problem is that the period from the Spring Equinox to the Fall Equinox is 186.4 days, while from the Fall Equinox to the Spring Equinox is only 178.8 days. The solar year is not cut into exact halves or quarters like these calendars suggest. In order to match up so that the start of each of the "seasons" designated by these calendars will land on the "Tekufah," the "Tekufah" would need to be a minimum of 4 days long. This idea that "Tekufah" might refer to any day in a period of similar astronomical events, rather than one precise astronomical event, made me look at the actual movement of the sun. What I found surprised me. In the summer and winter around the solstices, there is a 30-day period where the sun rises and sets within an arc of less than 1 degree. During the next five months it "travels" about 54 degrees across the western horizon, and then spends 30 days back on the other end. Since I was looking for a 30-day period in the spring in which to start the year, I found that to be an interesting coincidence. Near the spring and fall equinox, when the sunset is "moving" at its fastest, it goes through about a 13 degree arc in 30 days. I have added a row (#9) to the chart that covers that 30-day period centered on the equinox. Just like the 30 days where the sun hangs out on one end of the spectrum are centered on the solstices. I received your letter of May 12, in which you asked for some data about barley. It is real coincidence that recently I have been receiving two other letters from different countries, all dealing with the same subject. Well, first of all, I want to give you some general information about barley growing to day in our country, which may use as a background for better understanding. As a matter of fact, barley has been diminishing steadily in our country for the last 10-15 years and covers today no more than approx. 10% of the total small grain production. This trend is due to the much lower prices for barley in compare with wheat prices, whereas the yields of both grains are more or less at the same level. The main region for barley growing is in the Negeb (South) between Beer Shebah and the Gaza strip. In the Jordan Valley there is hardly any barley left to day. Among the Arab farmers in the vicinity of Jericho there can still be found some small patches of barley. This year was a very exceptional one, from climatic point of view. We have had an extreme wet and cold winter and therefor there was a great delay in the ripening of wheat and barley. Both are sown as a rule, in November and the harvest starts around the end of April - the beginning of May. As stated, this year the first wheat and barley have been harvested not before mid of May in the Jordan Valley. However, it is not right of course to make a comparison between to-day and the Ancient time, not as far as concerns the variety of barley and not the way of harvesting. To-day we have to wait with the harvest until the grain is entirely dry which means a moisture content of 12-13% only. Otherwise the mechanical harvester does not perform a clean threshing and the grain cannot be stored without further drying. In the ancient times and even to-day with primitive methods the barley and wheat were harvested with a sicle and left on the land in sheaves for further drying. Therefor the crop could be harvested a couple of weeks earlier even if the barley would have been harvested with 20% moisture content. As you probably may know, at Passover the first Omer of barley was brought as sacrifice to the Temple and before this day, the new barley was not allowed to be consumed neither for the animals. New wheat was not allowed to be consumed before Pentacost or at least as long as old wheat was still available. In the Talmud, it is mentioned that there were years that the barley was not yet ripe at Passover. In order to be able to bring the Omer sacrifice of barley in time to the Temple, they used to sow barley upon some flat roofs in the Jericho valley, which would be ready and apt to the Sacrifice on the Passover. The Omer is not a big quantity of grain. I guess that this rather extended answer will satisfy you but in case that there is still any information required, don't hesitate to write again. This letter, by a director in the Israeli department of Agriculture, has been around on the internet for a while and makes its appearance on articles discussing barley and the calendar. As it is written by an expert in the field (pun intended), it holds some interesting statements regarding the barley. First, he indicates that the Jordan Valley is the first place that grain generally ripens (both now and in ancient times) but admits that not much barley is grown there today. He also confirms what I said earlier about barley not being grown as much in the rest of Israel as well. Both of these add weight to using the earlier month when there is a controversy about the state of the barley. Another timing fact mentioned in the letter is that he says that the end of April or beginning of May is the normal time for the harvest to start, but then explains that in ancient times, the harvest would have started a couple of weeks earlier. This puts the time frame of average start of the ancient barley harvest around mid-April. For the sake of simplicity, I'll use April 15 as a mid-line date. So, what days would you need to start your year on, in order to have the wave sheaf day fall as close as possible to April 15? I have added a row (#10) to the chart that shows them. This is complicated since some think the wave sheaf day always falls on the 16th while others believe it falls on the first day of the week. I have used the red line to indicate using the 16th, while the additional days that become possible using the first day of the week are reflected in the orange part. This may not mean much to you unless you know me personally, but I have also added a row (#11) to the chart based on a personal revelation I feel that I received from the Father while building this chart. One evening, just before bed I prayed that the Father would show me the astronomical sign as to when the year should start. That night I had an unusual dream from which I awoke with a strong feeling that it was the answer to my prayer. In the dream, I was given an impression of two numbers, 5 and 1.43. I didn't remember anything else from the dream except those two numbers and that feeling of knowing it was an answer to my prayer. I did online searches on those numbers relating to everything I could think of involving astronomical data or calendars or historical testimony without finding anything promising. Finally, I put that aside and went back to my research where I had been plotting barley harvests against the position of the sunset from Jerusalem. I had previously noted that every year in which both groups felt there was abib barley the position of the sun was at 265 degrees or greater. That made me realize that what I was already looking at was 5. 5 degrees short of directly west, which is what 270 degrees is. I wondered what would happen if I added the second number, 1.43, to that and charted it. Would it cover a 30-day period if I looked for sunsets in an arc 6.43 degrees both sides of the equinox? Would it match up with any of the other evidence I was examining? I've charted it, but in green, so you can take a look at the evidence yourself. Looking at the chart, there are several lines that contain orange as well as red. The orange denotes fuzzy areas or implied data. For instance, regarding barley data (on the lines numbered 2 and 3), the red stands for days (in relation to the equinox) that barley has actually been found, and the orange is in between since with data on both sides, it is definitely implied. On line 4, the first and last days highlighted are possible, but would require a specific configuration of 29-day and 30-day months. The ends of the data on lines 6 and 7 are a little fuzzy due to the inexact science of where the Aries sector actually begins in the sky. I already explained above how the orange on line 10 is due to different interpretations of determining the wave sheaf day. The first thing that stands out to me about the data is that every single piece of data includes at least some days where the year should be started before the equinox. Considering that the two least arbitrary theories are to either start the year with the new moon closest to the equinox or to start the year with the first new moon after the equinox, there is very little doubt which one is better supported here. There are two outliers in the chart, one early and one late. Philo's testimony, already somewhat questionable since he makes two statements about the growing year that are difficult to reconcile, has the new year starting quite a bit earlier than every other method. The letter from the Israeli department of agriculture implies a series of dates a little later than everything else. In the case of Philo, his statements about the crops, make me think that he is making general statements about the way things work, rather than giving an exact description. Taken that way, since his statement works out with the other data more than 80% of the time, it still makes sense, just not as an absolute statement. As far as the letter about modern barley harvesting, the fact that it implies that barley will remain sickle harvestable for only a couple of weeks (which I have confirmed from other sources as well), makes it all the more imperative to get the very first available barley for the firstfruits offering. Leviticus 2:14 talks about drying the abib barley with fire to make it ready to offer, which indicates that it may be harvested and offered a little before it is really ready in the field. All things considered, I don't think it is unrealistic to tack on a week or so to the beginning of the normal season described by the letter in order to avoid some farmers losing grain by having to wait until the next month. Although it doesn't matter for this year, since 2019 is within the safe zone supported by every line of data except possibly line 10, this leads into trying to determine at which point exactly the break point is. The data for barley on the chart only spans a total of 28 days, so two more are needed on one end or the other. Picking one of the Josephus lines and which side of the fuzziness to use allows three possible options as well. However, both of those leave us with one possible interpretation that matches up with the ancient Rabbinic interpretation and the numbers in my dream. This leaves me confident that starting the year when the equinox falls no later than the 15th of the first month (which is basically the new moon closest to the equinox) is the very best option and can fit nicely with all the data available. As far as the chart goes, this means starting the year as early as the 7th of March, or 14-15 days before the equinox. If you are still thinking that determining the equinox by shadow and then starting a new year makes it more user friendly as a starting point, and are wondering how I propose a normal person in ancient Israel could calculate 6.43 degrees to determine when a new year starts, you're asking the same questions I was asking myself. The evidence in the chart is solid, but I wanted something to cap it off and in the hope that determining the beginning of the year is as easy to see as the beginning of the day and month. The measurements given for the court of the Tabernacle are given in cubits, but for measuring proportions and angles, the exact length of cubit that they used doesn't matter. Exodus states that the gate of the Tabernacle courtyard is on the east side and that it is centered, 20 cubits across, with 15 cubits of hangings on each side. The length of the courtyard is 100 cubits and the height of the hangings is 5 cubits. Given these measurements, it is possible to calculate the angle from the bottom corner of the gate to the top corner of the hanging at the back end of the Tabernacle. It comes to 2.83 degrees off of level and 8.53 degrees off of parallel with the line formed by the side of the tabernacle. The pyramids were likely laid out east to west based on the equinox. The Hebrews having just left there, could well have been familiar with the process. Yahweh specifically commanded that Moses set up the Tabernacle for the first time on the first day of the first month, which is certainly in the neighborhood of the spring equinox. Given those facts, I think it reasonable to deduce that the equinox could have been used to lay out the Tabernacle in the east-west layout that is described in the instructions. Whatever method was used though, it was certainly commanded to be laid out very close to an exact east-west line. I used satellite photos to find the latitude and longitude of the supposed site of the Tabernacle near ancient Shiloh. We don't know if the cloud that directed the location of the Tabernacle continued to do so all the way to Shiloh, but considering that that is the place where it finally stopped, it seems plausible. I also located the elevation of the site on an official Israeli topographical map. Armed with this series of numbers I calculated the point in the sky at which the sun would need to be to cause the back wall of the Tabernacle to cast its shadow all the way to the front gate. (Approximately 12 minutes and 23 seconds before official sunset.) I then ran all the data through the US Naval Observatory website to determine on which day(s) the corner-shaped shadow created by the back left corner of the tabernacle would or would not fall inside the gate. The answer? This year, the corner shadow would stop passing through the gate on the evening of March 6. In our chart, that equates to the column under March 7th and matches up precisely with the rest of the compiled data. In other words, an observer at the gate of the Tabernacle of meeting could stand there and see the evidence for the new year, the new month and the new day to begin. All three would be appearing as visible signs from the lights in the heavens all occurring in under an hour! My conclusion, in studying the Biblical calendar, is that the lights in the heavens that God gave us at Creation are the key and give us a very simple calendar. Watching for sunset and then the appearance of stars to begin the day, watching for the first appearance of the moon's sliver and watching for the sun to set at a particular spot in the heavens are easy things to do. As Moses points out in Deuteronomy 30:11-14, these commands from the Torah are not too difficult for us to obey. In fact, while the Tabernacle was standing, a small child could easily be trained to make every observation needed for the calendar. As far as 2019, I am currently convinced that the year has already started and we are approaching Passover rapidly. I urge you to double check the evidence presented in this article, and then keep the feast wholeheartedly, even if you do come to a different conclusion than what I have laid out. If you have feedback or feel I am in error on any of this, please leave me a comment below. Thanks for reading all the way through! "How does one know which lunar month includes the first day of spring? In the Talmud (Sanhedrin 13b), Rabbi Samuel, the son of Rabbi Isaac, states that the first day of spring should occur in the lunar month while the moon is still waxing. The moon grows from new to full in the first 14.5 days of the month. If a Rosh Chodesh (new moon) occurs at any time between the sixth and the 20th March, then on the 21st March the moon will still be waxing and that month is designated as Aviv. If this is not the case, the next lunar month is chosen. The earliest date Pesach can occur is March 21, and the latest it should occur is April 20." Haven't gotten thru all your comments yet, but because of my poor description, I think I should correct what we do for new moon. Basically, i believe the moon phase is renewed the first instant after conjunction. But, because of the international date line being 180 degrees from Jerusalem, I think if anyone in the world has started their new day prior to the conjunction, we should wait to start the new month until their next day. That would insure they don't have a portion of the old month in their new month. That's where the 12 hours I mentioned comes in. If Jerusalem is 12 hours or more into their day when conjunction occurs, the folks in Alaska, Russia, etc would already be starting the next day, thus we should wait until their next day to start new moon. Thus all in the world have the same new moon day. Clear as mud? I am just trying to have a system where the world is on the same schedule, and no one has a portion of the old month in the new month. Honestly, because of the fact a new moon sliver isn't generally seen before roughly 18 hrs old, the way we do it coincides with the sighting many times throughout the year. This field will not be shown publicly.